Contact: prof. RNDr. Michal Kozubek, Ph.D. The Centre for Biomedical Image Analysis (CBIA) is a well-established interdisciplinary research unit that primarily attends to the development and benchmarking of algorithms for the analysis and synthesis of cell microscopy image data but secondarily also to the analysis of biomedical image data produced by other imaging instruments as well as to the employment of computers in the optimization and automation of image acquisition process. 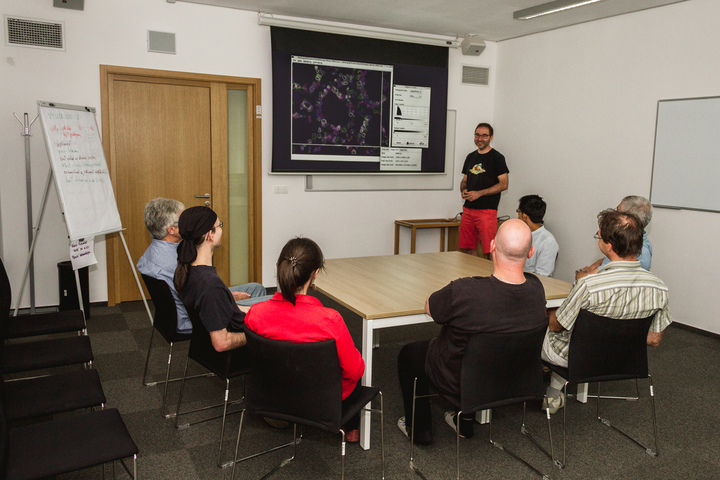 CBIA gathers experts not only in computer science, mathematics, and physics but also in biology and medicine who conduct complementary research on cells using the developed image acquisition and analysis methods. Our ultimate goal is to describe the spatiotemporal behavior of cells and its changes during cancer genesis, which is crucial for diagnostics and therapy. To this end, our main partial goals are in developing reliable and ideally automatic cell segmentation, quantification and tracking algorithms that in turn require rigorous benchmarking approaches exploiting reference datasets with known correct answer (so-called ground truth), which finally leads to the development of cell simulation methods producing digital cell phantoms along with their virtual microscopy image data. To cope with all these tasks, CBIA closely collaborates with other relevant groups across Europe within pan-European research infrastructure projects like ESFRI Euro-BioImaging (on national level Czech-BioImaging) or COST NEUBIAS. In recent years, CBIA has co-organized Cell Tracking Challenge that has established a widely recognized international benchmark for cell segmentation and tracking published in Nature Methods (Dec 2017). Responsible contact: prof. RNDr. Michal Kozubek, Ph.D.